Hiya guys! Can you believe I have more from the lovely Brandie at Nail Hoot Lacquer to share? 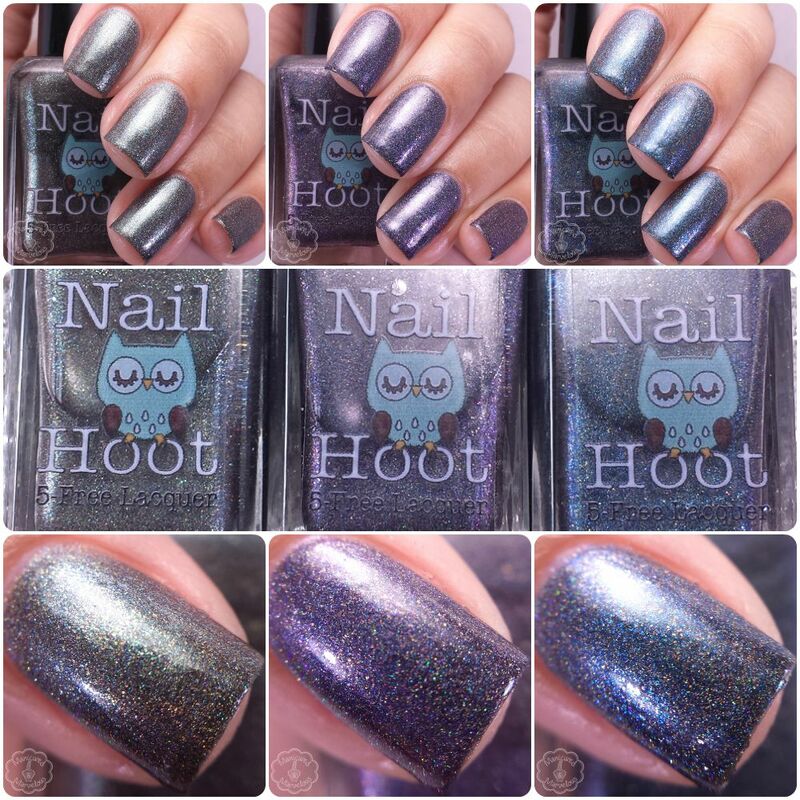 Well Friday is a huge release date for Nail Hoot Lacquer with two different trios and a Halloween polish being released. As I always like to say, bring on the polish! Today I'll be sharing swatches for the remaining trio that I had yet to show you, the Space Galaxy set. Let's tour the universe together! The Space Galaxy Trio by Nail Hoot Lacquer will be released on Friday, September 18th. These will be available as a set as well as individually for $7.00 each. Escaped Velocity can be described as a dark green to grey scattered holo shimmer polish. This is definitely one of those polishes that are hard to capture on camera. In person this polish has a lot more of an olive green tone to it, but on camera that translates to a dark grey. The formula was a little on the thick side, but very manageable and easy to layer. Consistency wise it's also a bit sheer in a single coat. Shown here is three coats sealed with a glossy topcoat. Zero Gravity can be described as a dark blue scattered holo shimmer polish. Hands down my favorite from the trio! I love the richness of the tone and the subtly of the holo. Formula and consistency were great, not too thick or too thin. Super even layers and not as sheer as the others. Shown here is two coats sealed with a glossy topcoat. Dark Matters can be described as a plum/purple scattered holo shimmer polish. Love this shade so much! Doesn't it feel like the perfect base for a galaxy mani? Seriously some light sponging and a few stars, it's perfect! The formula is similar to that of Escaped Velocity and is a little sheer on the first coat. The consistency is a tad thick, but is manageable to layer without any issues. Shown here is three coats sealed with a glossy topcoat. Overall another nice trio brought to you by Nail Hoot Lacquer! 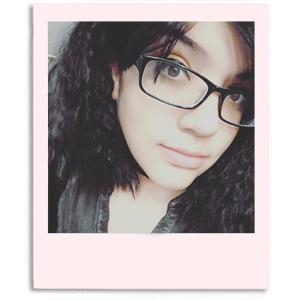 It's hard to think of Brandie being a relatively new to the indie community because her creations are always so beautiful. These bring the galaxy to our finger tips and are a unique trio to own. Definitely have to say Zero Gravity is a must-have, it's probably one of my favorite Nail Hoot polishes to wear to date. As I mentioned before, the Space Galaxy Trio by Nail Hoot Lacquer will be released on Friday, September 18th. These will be available as a set as well as individually for $7.00 each. Love Zero Gravity! And the packaging is so incredibly adorable! OMG I need all 3. These are gorgeous! Love Dark Gravity! Great swatches. The blue and purple are great! These are the first from this brand that have really caught my eye! Beautiful! I do love everything to do with space! The close-ups on these turn me into hte hearts-for-eyes emoji! WHAAAAT! How do I not own any of these? Stunning! I love the inspiration for this trio. The colours fit so perfectly! These are perfect as a trio! Beautiful swatches. The trio is gorgeous, but Zero Gravity is my favorite. Wow, these are all beautiful!! They seriously look like galaxies in bottles! THey're gorgeous! I really really need them lol! All three are very pretty!